Don’t Let a Dirty Roof Cost You Thousands of Dollars! Those unsightly black roof stains may cost you thousands of dollars in repairs or age your roof prematurely! Soft Wash your roof TODAY to prevent problems, increase curb appeal, and restore longevity! Get a FREE Soft Wash Roof Cleaning Quote TODAY! Our investment in Soft Wash Roof Cleaning is unmatched. We guarantee it! With our safe and effective state of the art Soft Washing System, we’ll exceed your expectations. Aqua Boy will give a free estimate and answer all your questions. We are proud of the service we offer our customers! Aqua Boy will assess your property before beginning any form of cleaning. Next, a determination of correct chemical usage and application will be followed. Aqua Boy Roof Cleaning process must meet the highest standards of customer satisfaction before requesting any form of payment. Yes! Leave the fear of safeguarding your flowers, plants, trees, shrubs and lawn to us. We know how much money and hard work it takes to beautify your landscaping. We will wipe out those ugly black stains on your roof, but not everything else! Aqua Boy Powerwashing takes safety (and your landscaping) seriously! Moss prevents water run off,causing Mildew and Mold. Moss should NEVER be Pressure Washed. Lichens root into your shingles lessening their protection. Our Soft Wash cleaning will treat all forms of Algae, Moss and Lichens. Visit our web site for more information. We are starting to see more and more magical formulas on the market that promise homeowners quick and easy cleaning results. The Soft Wash Roof Cleaning process should be performed by an experienced professional with the right equipment. Customers LOVE Aqua Boy Soft Washing! Our roof was in TERRIBLE shape with black stains, streaks and all kinds of growth. Aquaboy Power Washing came to our home in Voorhees for an estimate. From the moment they arrived, we knew this was the company to help clean our roof. They were on-time, professional, and courteous. Our roof looks amazing now! If you need a roof wash in Voorhees, call Aquaboy Power Washing! Thank you thank you thank you Aquaboy Power Washing! 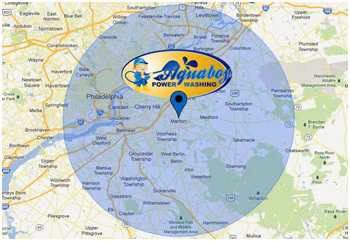 After searching and interviewing Power Washing companies in Moorestown, we settled on Aquaboy. WOW, they got our fence, home and roof washed so clean we thought everything was brand new! If you live in Moorestown, NJ and need Power Washing, fence washing or roof cleaning, call Aquaboy Power Washing, you won’t regret it! Thanks again! Thanks to Aquaboy Power Washing, my home looks GREAT now! We tried the soft wash roof cleaning and power washing in Marlton and we have to say we are impressed! Great job Aquaboy! We love the roof washing, it got our roof very clean. We will definitely call you again! Our Medford Power Washing and cleaning project was big! The whole house, roof, sidewalk, fence & driveway nneded cleaning. We called Aquaboy Power Washing and they showed up the same day for an estimate! Not only was the owner polite and professional, he took us through every detail of the project! When the crew showed up for the job, they got EVERYTHING clean! Wow. Our ‘fixer-upper’ home turned into a beautiful home almost overnight! For Medford Power Washing & roof cleaning, it’s Aquaboy Power Washing all the way! Get your FREE Quote from Aquaboy Power Washing TODAY! Click the button to the right and fill out the form. We'll send you a personalized quote! Contact Aqua Boy Power Washing! Cleaning and Power Washing service in all of South Jersey! Let our experienced staff show you why our comany is the best. Contact us below for a FREE quote!